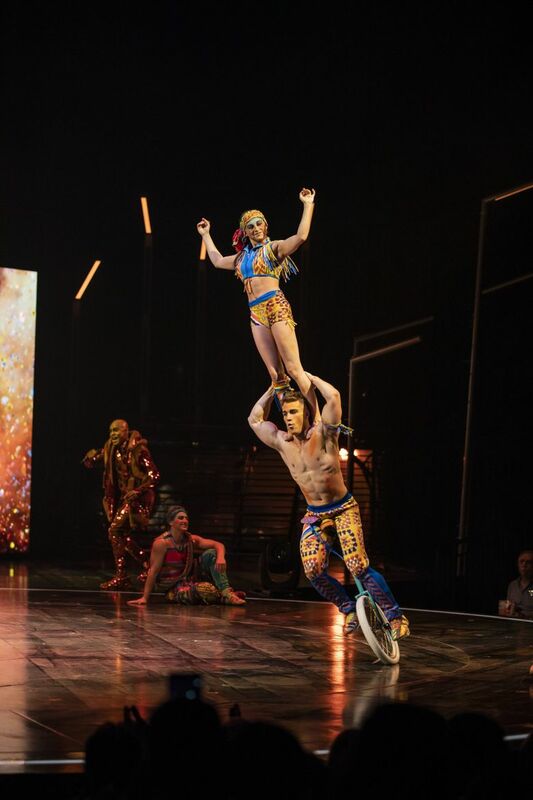 "Volta," now at Redmond's Marymoor Park, is not the best show in the world-tripping circus company’s arsenal; it’s not bad either. And just when “Volta” needs more high-voltage excitement, aerialist and hair hanger Danila Bim provides it. And then came the aerialist who hangs by her hair. Up until that point “Volta,” the new Cirque du Soleil show playing at Redmond’s Marymoor Park, was buzzing along enjoyably, if predictably. Adorned with monochromatic and Technicolor costumes, and Cirque-spiffy lighting, “Volta” is loosely gathered around a typically simple story of a feather-headed kid called WAZ (Joey Arrigo), who is shunned by a cluster of grimly-garbed folks (The Greys) who are obsessed with their large, glowing cellphones. The production is intended as a fable of self-acceptance and non-conformity — not to mention, extreme physical fun versus passive digital addiction. Yet there are pop-savvy nods to “Game of Thrones” (the strolling electric violinist is coifed like the exiled princess Daenerys Targaryen) and “The Hunger Games,” as WAZ becomes a contestant in search of fame on the “Mr. WOW Show.” In case you miss it, the moral of the tale is: Money and fame aren’t as important as “authenticity” (just be you!) and self-acceptance. You can be glad that WAZ is accepted by a group of gymnasts, colorfully garbed by Cirque designer Zaldy Goco, who has also costumed Lady Gaga and other pop stars. 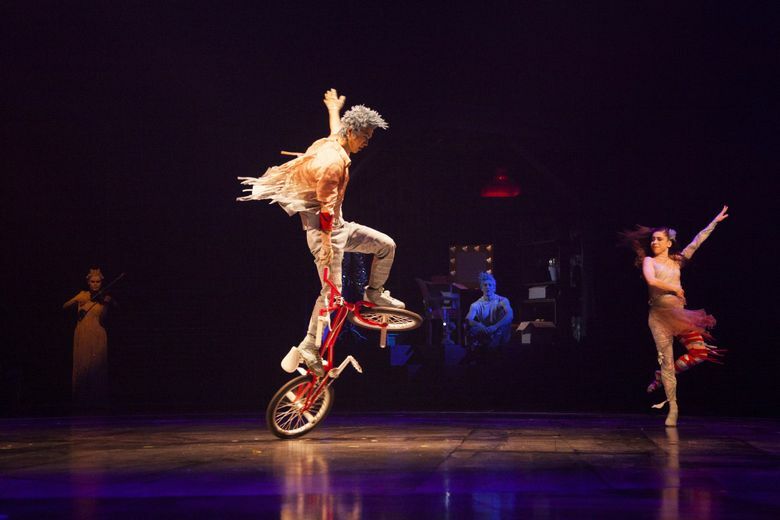 These “Freespirits” resemble the hippie tribe in “Hair.” And they are the acrobats who buzz around on roller skates and unicycle, and launch into such acts as another high point in the two-hour program: the Trampowall. This involves two large trampolines, bisected by a grey divider wall. And the gymnasts are lords a-leaping as they dive, climb and jump over and around one another, to Anthony Gonzalez’s throbbing synth-beat music. There’s a dexterous, gibberish-spouting clown on hand (Andrey Kislitsin) who has a funny extended gag fussing with washing machines on the fritz. There’s some skilled “shape diving” through a tower of different-sized hoops. 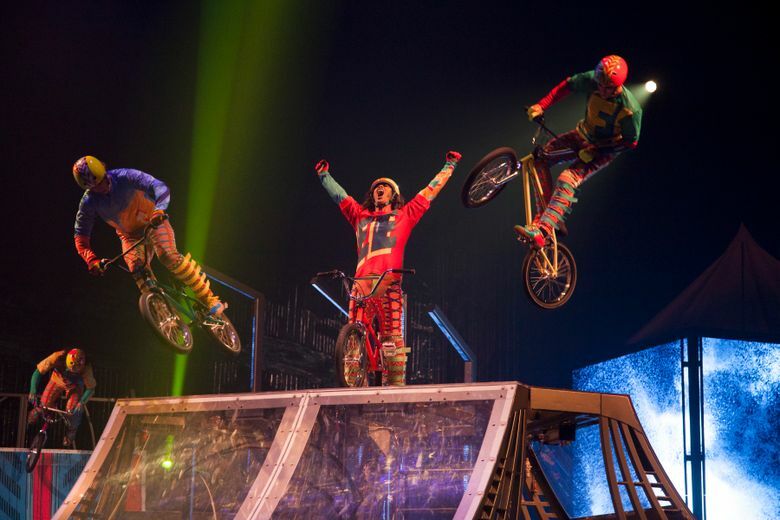 And the finale spree features a crew of acro-bicyclists doing wheelies and other BMX (bicycle motocross) tricks, as they soar off jump boxes and onto steeply curved ramps. All of this belongs in a Cirque show that seems more squarely aimed at kids (and street sports) than usual. However, some acts are slackly paced, and linger too long before ramping up to the big “ta-da!” moments. But just when “Volta” needs more high-voltage excitement, the remarkable Brazilian aerialist and hair hanger Danila Bim provides it. 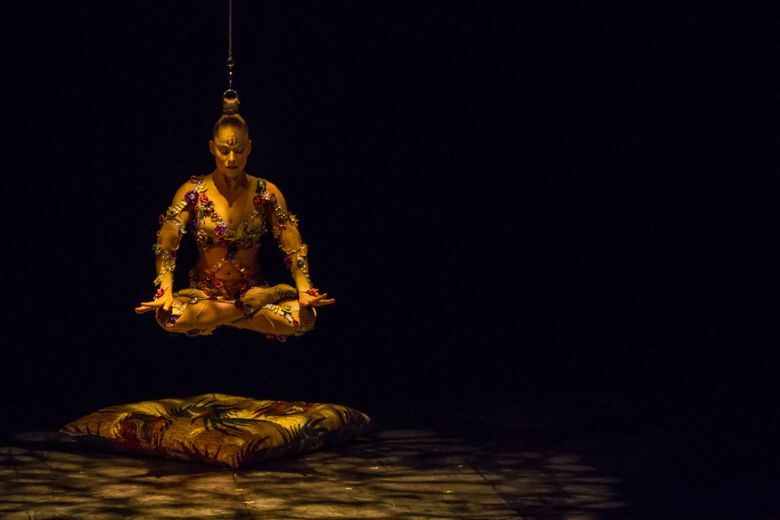 You first see Bim seated in cross-legged meditation, like a Buddha statue in a flower-encrusted bodysuit. Then gradually, gracefully, she is wire-lifted into the air by her bun of coiled tresses. You can hear the crowd catching its collective breath and cringing. Ouch! But Bim is so serene as she glides and whirls like a top while suspended from her hair, that you stop worrying about her. You just marvel at what a lithe and fearless vision she is up there, enchanting us. And hey – if you were worried that a mechanical problem in “Volta” might spray you and the stage with a plume of vegetable oil, as it did during a show earlier this month, don’t worry. No such calamity has occurred since. “Volta” by Cirque du Soleil. Through Nov. 4; Marymoor Park, 6046 W. Lake Sammamish Pkwy. N.E., Redmond; $39-$145, $270 VIP; 877-924-7783, cirquedusoleil.com/volta.